HERE BE SPOILERS! TURN BACK IF YOU HAVE NOT READ THE BOOKS! Can't wait for December 2003? Wondering where the hell the second half of the Two Towers book went? We have a few (tentative) answers. The thumbnails are a shorthand guide to other sites' full-size images, and we are indebted to these original sources. Many of them have have extensive galleries with hundreds of images, and we encourage you to use the links below to visit their sites. Also, Tolkien Online's list of possible changes from the book is a good resource for those of you wondering what ideas are floating around out there. Updates on this page: The E3 con screen caps have reappeared at Herr der Ringe (AICN caps) and Elflady.com (TORN caps). The majority of the caps are on pages three and four in the Minas Tirith, Pelennor, and Black Gates sections. On page two, a new Paths of the Dead section has been added, with other pictures scattered throughout this page. Discuss! The message board is here. Disclaimer: All Lee/Howe artwork featured on this page is assumed to pre-date their work as concep-tual artists on the film. In other words: of interest, but not set in stone. Please visit Rolozo Tolkien for the full collections. For specific questions, comments, or additional pictures you've found, please use our email form. 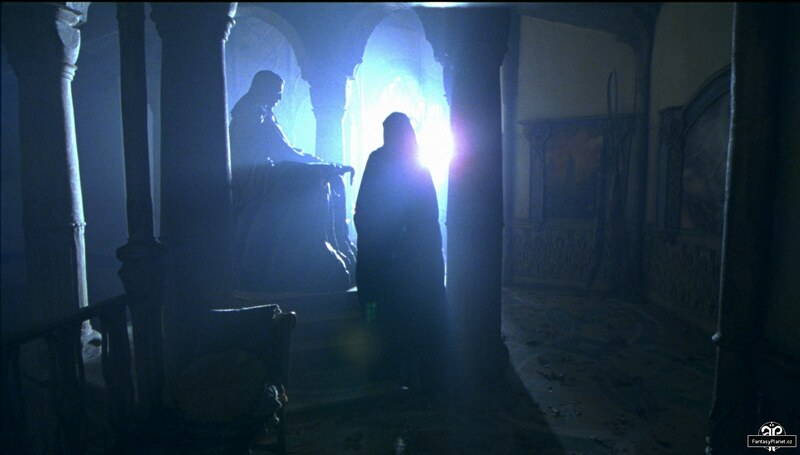 << Reforging of Narsil: Peter Jackson has confirmed that this scene will open ROTK. >> LOTR.net: "Arwen reluctantly agrees to leave Middle Earth"? Lorien: Apparently Elrond and Arwen make a trip to Lorien (notice Galadriel's basin). The first two pictures are, however, from Rivendell. This could end up on the TTT DVD... or not. See Alley Cat Scratch's costume page for the connection between these scenes. >> Assorted shots of Arwen. Hold cursor over image for description. << Shelob, from one of the LOTR making-of books. << Richard Taylor holding up a model of Shelob. >> Artwork at Rolozo Tolkien: far left, Alan Lee; center and near left, John Howe. << Mordor: Generic shot at Numenoreen. << Effects shot of Mount Doom. >> Toy Biz figures of Frodo and Sam disguised as Orcs. Got something we don't? You know where we live. If you're interested in hearing about updates to this page or the Daily Digest in general, you can sign up for the site newsletter at our Yahoo Group.